Although kids are often afraid of worms at first I find teaching a worm theme can be sooo much fun. Usually by the end kids are less afraid of worms and they have learned a lot about these little creatures along the way. 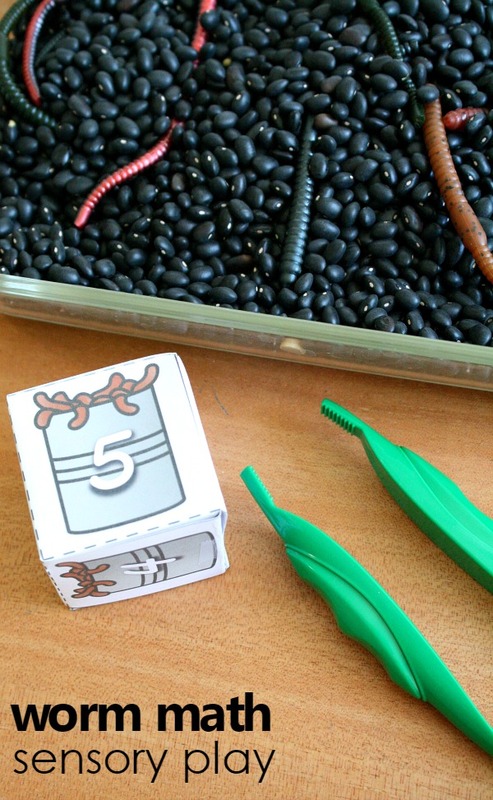 In our worm theme home preschool and classroom lesson plans we share a ton of ideas for week full of playful worm-inspired learning. 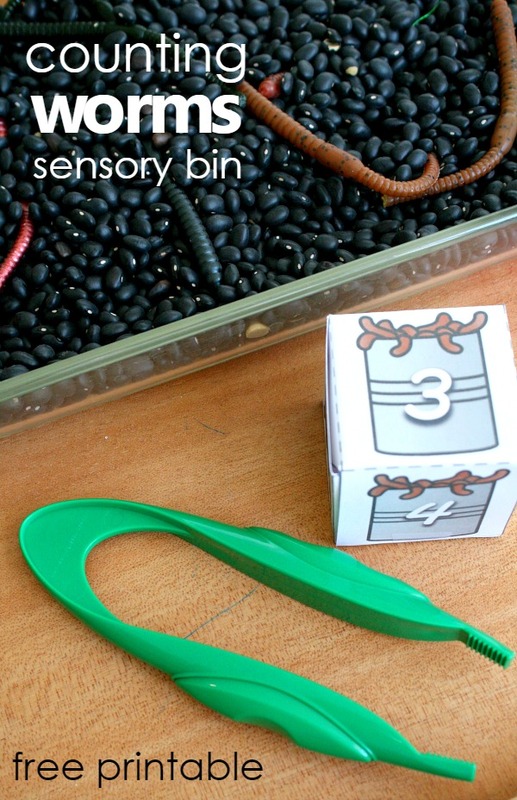 We even went crazy viral with our wiggly worm sensory play idea on Facebook. 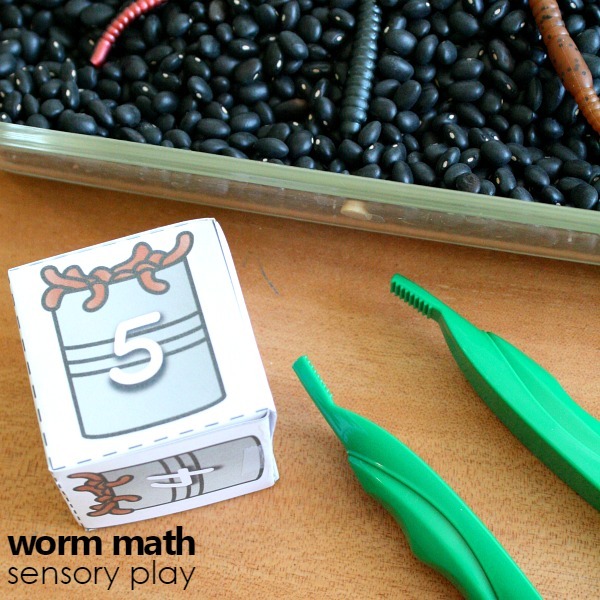 But sometimes we don’t want to get quite as messy, so here we have an idea for a counting worms preschool math sensory bin that includes free printable number cubes for you to download and use in your home or the classroom. 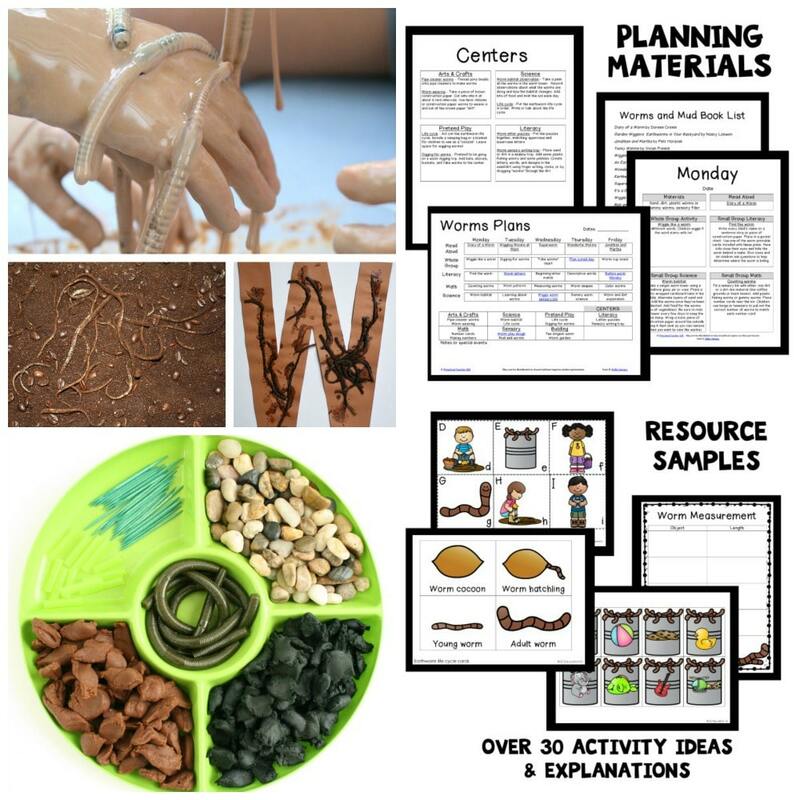 FIND EVEN MORE WORM THEME ACTIVITIES IN OUR PRINTABLE WORM THEME LESSON PLANS. 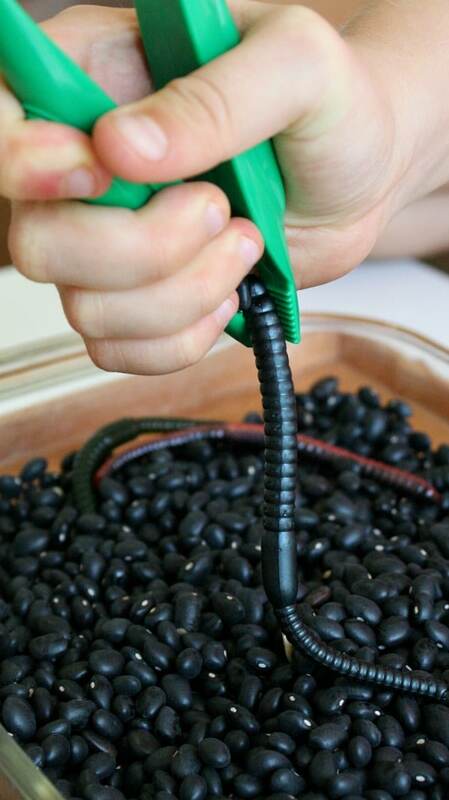 Sensory filler-We used black beans, but you could use black aquarium gravel or real dirt if you prefer. 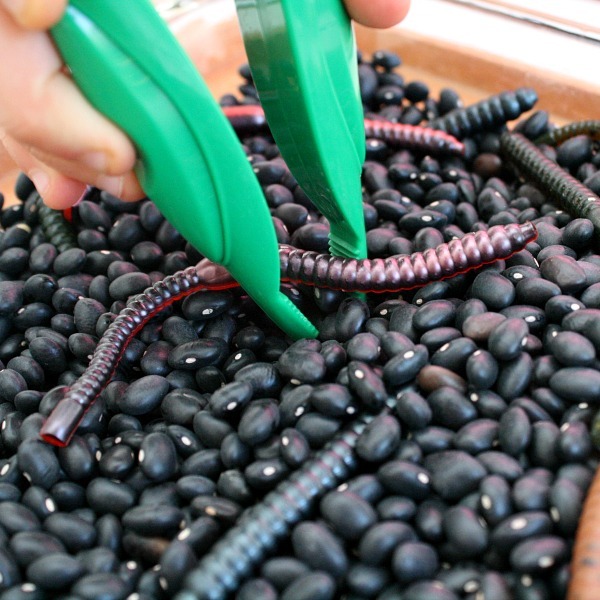 Worms-We used plastic fishing worms. You could also use thick yarn or chenille stems. Jumbo Tweezers or Tongs-We love these ones from Learning Resources. 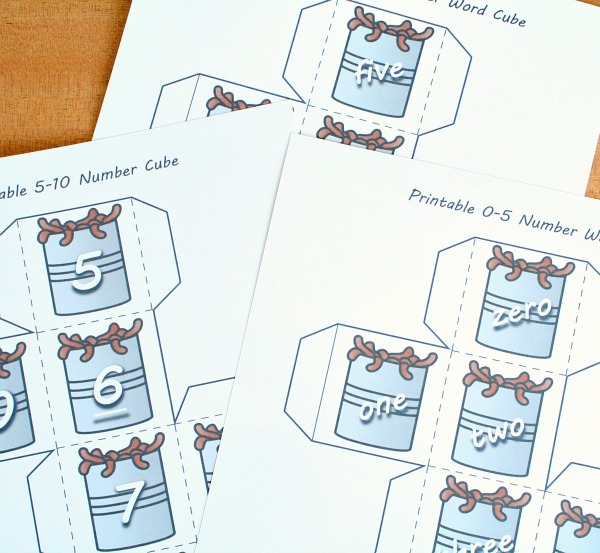 Printable number cube-Choose between numbers or number words. You can either set this up as an independent learning centers in the classroom or an invitation to play at home. As kids work to maneuver the jumbo tweezers they are practicing fine motor skills. If your child struggles to much with the tweezers at first let him or her use hands only and practice the pincer grasp. As your child rolls the cube and counts out the corresponding number of worms, take time to discuss math vocabulary like more, less, same amount, equal, how many left, etc. Get a full week of playful worm theme ideas! 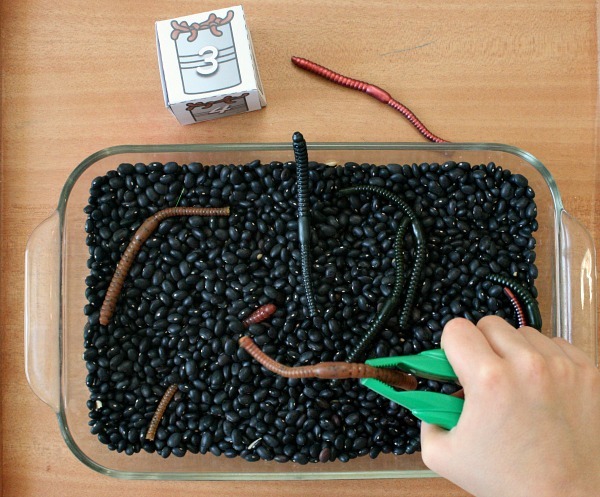 If your kids are fascinated by worms, extend this activity into a full week of learning and play. Save time and get right to the playful learning with our printable lesson plan sets. Each set includes over 30 playful learning activities related to the theme, and we’ve provided different versions for home preschool families and classroom teachers so all activities are geared directly toward your needs.